View from near Great Tor over Three Cliffs Bay. 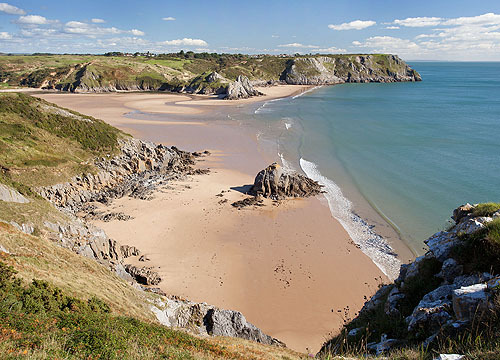 Three Cliffs Bay has one of Gower's most picturesque beaches . The Three pointed jagged limestone Cliffs that project into the bay give this wide sandy estuary of the Pennard Pill it's name. There are stepping stones to cross the river on low tides . The Ruins of Pennard Castle are inland amongst the Sand Dunes , above the valley of Pennard Pill with Salt Marshes below.